Yesterday was the day to pick up The Catt from school. The 5:40 a.m. embarkation had been wise; the traffic presented not a single snaggletooth all the way from Point A to Point B. About a half hour outside of Champaign I started with the wake-up calls, but to no avail. Wouldn't you think that the sarcastic barbs I kept leaving on The Catt's voicemail would jar him into awakenness by osmosis? But no. I got off the interstate and refilled the gas tank, tick tick tick. I arrived at Ye Olde Hopkins Hall but still no answer on the phone, tick tick tick. It was a nice sunny morning and I strolled through the courtyard, tick tick tick. I meandered through the glass-encased study lobby which looks out on the courtyard, tick tick tick. And then I... but wait! Through the window I saw a beautiful brown speckled duck with two ducklings! Directly outside on the grass where I had just been minutes before! The mother duck was 1.5 feet long from head to tail and the two ducklings were each three inches long from head to tail; the babies were a much lighter hue than the mother and their coat had the appearance of fur rather than feather. The three of them were marching around in single file on the grass in the courtyard right outside the picture window while I watched from inside. Why do I never seem to have my camera with me when I want to take a picture? As you know I was in no particular hurry, so I kept watching the parade. But the longer I watched the more peculiar the whole milieu struck me. That the duck family was even in this courtyard was unusual right off the bat; how many times have you seen ducks marching around in your back yard, for comparison's sake? And the mother duck was quacking in a non-stop and frantic manner. Also, the mother had a fairly pronounced limp in her right leg (maybe that's what all the quacking was about?). And this marching the three were doing followed a perfectly circular pattern. Around and around and around they went, circling what I then saw was a two-foot by two-foot metal grate that was right there in the middle of the grassy courtyard. Hold on, the cast of characters is poised to grow. From stage left, a uniformed grounds-maintenance man enters the scene. He must hear the maniacal quacking out there, but he seems oblivious to the duck parade and instead is focusing on the metal grate. He steps gingerly toward the grate, seemingly on tiptoe, and apparently not wanting to disturb the circular march that I was watching. 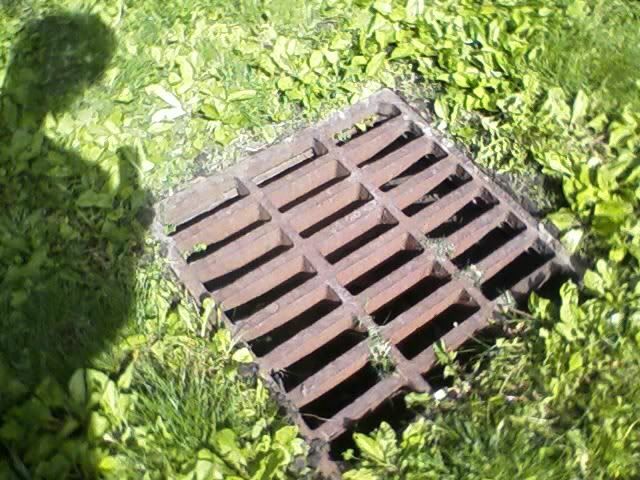 He briefly peered down into the grate and then exited the scene as gracefully as he had entered it; maybe his responsibility had been to check on the flow of water that was under that grate? I decided it was time to try ringing The Catt's phone again. No answer, of course. I left a message about how I was communing with nature and enjoying the circular parade. As I was blathering into the phone, I watched as one of the ducklings broke formation and wandered onto the crossbar of the metal grate. The crossbar was wide enough for this little duckling to walk across it, but how steady on its feet do you expect a baby to be? I was right to be worried! As I was finishing up that latest voicemail message, I was horrified to see the duckling hop blissfully upward an inch and then FALL into the abyss! I SCREAMED! I ran through that long lobby to go back outside to the courtyard to see if there was something, anything, I could do to help that little duckling that I feared was lost to a raging current far below the grate. Here comes the feel-good part of the story. 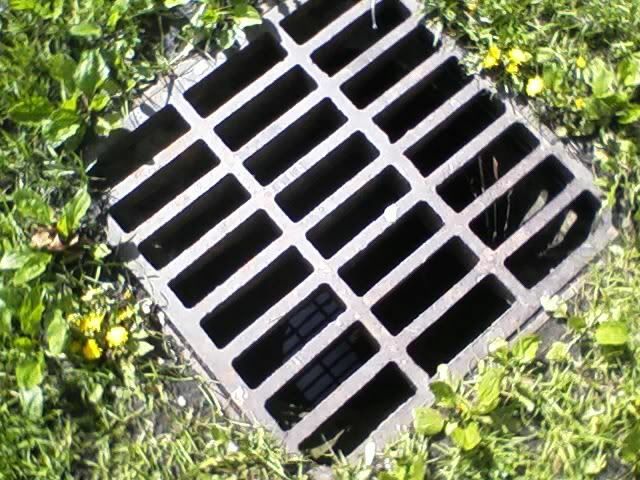 When I reached the grate I was VERY relieved to see that there was no water under it at all! Probably at some point in the past there used to be some water-related functionality to the grate, but I was pleased to see a solid bottom about three feet below the grate. The duckling was hopping around down on the floor, and it was even lined with grass clippings that had cushioned his fall. He was fine! Now get ready for the twist you didn't see coming. I sure didn't! On that grass-lined floor where the little duckling was hopping around, there were also five of his brothers hopping around with him! 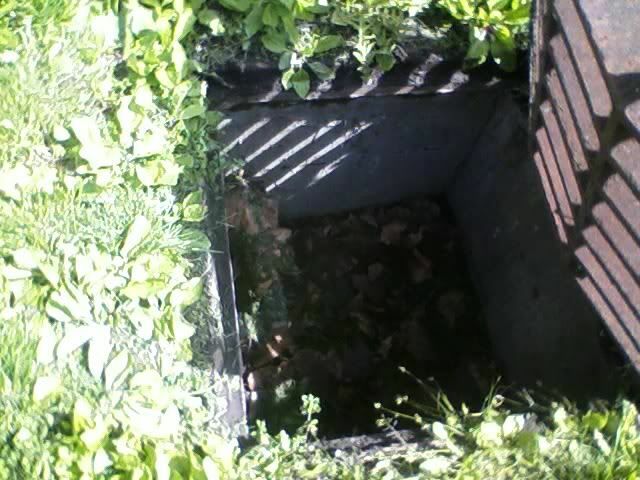 Six ducklings had fallen through that grate, one by one by one. Imagine the distress of that mother duck! Her frantic quacking (which was continuing at full volume through all this, by the way) had nothing to do with her limp but everything to do with the fact that her babies were disappearing one right after another. Oh, she knew exactly where they were and that they were unhurt, but she also knew she was helpless to save the little guys. So I got to work with the rescue. I curled my fingers around the bars of the grate and pulled and OOF! Nothing! It must be screwed in place, I thought to myself. I tried squeezing my hand between the bars of the grate, but that wasn't going to happen. I spun my head around with three hundred sixty degrees of frustration, and then tried pulling on the grate again. This time it budged! It hadn't been screwed down, it was just very, very heavy. Slowly and deliberately, I lifted off that heavy grate. The quacking continued, of course. I carefully put one foot down on the grass-lined bottom and was happy that it was solid and I didn't fall through. The six ducklings were scurrying around, not fully realizing that their adventure was drawing to a close and they would soon be reunited with their mother. I put my open hand under each duckling and, one at a time, boosted them up to the freedom of the grassy courtyard where their mother was (of course) quacking, about ten feet away. Each one waddled directly over to the mother duck. The instant the last one was out of the hole, she stopped her quacking. How about that! The mother duck started marching, now trailed by all seven of her ducklings. (Where is that camera when I want it?!) No longer in need of a circular parade, the group marched to a covered spot under a nearby shrub. The uniformed grounds-maintenance man came back on the scene and had witnessed the completion of my mission. He told me he had seen the ducklings trapped under the grate and went to call somebody to help get them out. He said he had been worried that the mother duck wouldn't take the babies back if he had intervened. I told him (and I'm quoting myself here), "She knew she needed help."